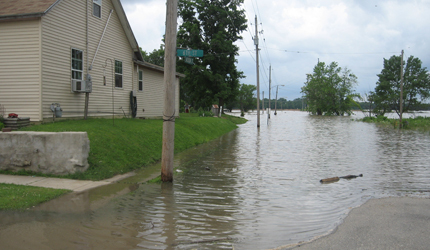 SPRINGFIELD – With severe weather predicted for the northern half of Illinois on Wednesday, the Illinois Emergency Management Agency (IEMA) today encouraged people to stay aware of local forecasts and be prepared to act quickly if storm warnings are issued. Joseph said it’s critical for people to have multiple ways to receive notifications and updated information about severe weather warnings, such as through a weather alert radio, Wireless Emergency Alerts (WEA), weather alert apps, TV and radio broadcasts, the Internet, outdoor warning sirens and more. National Oceanic and Atmospheric Administration (NOAA) weather alert radios can be programmed to issue a tone alarm and provide information about a warning that has been issued for your county. WEAs are available on most smartphones. Check your phone’s notification settings under ‘Government Alerts’ to ensure ‘Emergency Alerts’ is turned on. With a WEA-enabled phone, you will receive tornado and flash flood warnings issued for your current location, even if you’re traveling. Other smartphone alerting apps also are available, including the tornado app by the American Red Cross. Seek shelter immediately if a tornado warning is issued for your area. The best shelter is in a basement or cellar. If an underground shelter is not available, find an interior room or hallway on the lowest level, such as a closet, small interior hallways and bathrooms without windows. SPRINGFIELD – “When thunder roars, go indoors” is more than a catchy phrase about lightning safety. It’s a reminder that you’re at risk of being struck by lightning if you’re outdoors and can hear thunder. 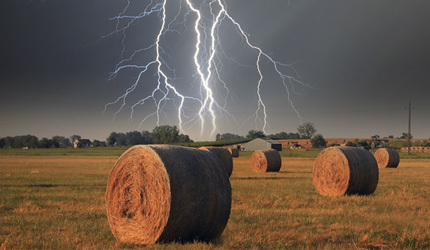 That’s the message the Illinois Emergency Management Agency (IEMA), the National Weather Service (NWS) and local emergency management agencies will promote during Lightning Safety Awareness Week June 19-25. SPRINGFIELD – According to a recent survey by the American Pet Products Association, 65 percent of U.S. households include at least one pet. 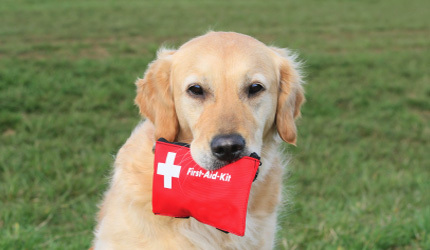 If your family includes a dog, cat, hamster or other furry, feathered or scaly friends, don’t forget to include their unique needs in your home emergency plans. Throughout the month of June, the Illinois Emergency Management Agency (IEMA) and local emergency management agencies will highlight the importance of emergency preparedness for pets. A disaster may require you to evacuate your home, sometimes with little notice. It’s important to take pets with you, as an evacuation could last several days, even weeks, and your pets likely cannot survive without care. Plan now for places you and your pets can stay following an evacuation, as many public shelters do not allow animals inside. It’s also important to have a back-up emergency plan in case you can’t care for or evacuate your animals yourself. Talk to neighbors, friends and family to make sure someone is available to care for or evacuate your pets if you are unable to do so. Additional pet preparedness and general emergency preparedness information is available on the Ready Illinois website at www.Ready.Illinois.gov, the Ready Illinois Facebook page at www.facebook.com/ReadyIllinois and on Twitter at Twitter.com/ReadyIllinois. SPRINGFIELD – The minutes and hours following a disaster can be scary and stressful for anyone. Emergency preparedness, such as a home emergency supply kit and a plan for how family members will communicate in a disaster, can ease post-disaster stress. For households with members who have disabilities, functional needs or may need assistance during an emergency, disaster preparedness can be a matter of life or death. Joseph said the Ready Illinois website offers a guidebook with preparedness tips for people with visual, cognitive or mobility impairments; people who are deaf or hard of hearing; those who utilize service animals or life support systems; and senior citizens. 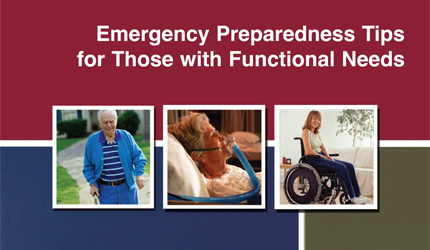 The guide, Emergency Preparedness Tips for Those with Functional Needs, is available at www.Ready.Illinois.gov. The videos were developed in collaboration with the Illinois Deaf and Hard of Hearing Commission.